In shield and platform areas, various methods are expected to give indications on surface ages, e.g. dating of weathering mantles or reconstruction of the thermal history of upper crust rocks which presently crop out. Radiochronometry and thermochronology were widely used in the last decades to give estimated denudation depths and rates in active orogens as well as in shield and platform areas. Although usefully integrated in modern geomorphology, these methods sometimes reveal discrepancies with the results of field-based geomorphology. The principles of morphostratigraphy are first presented, and then the paper provides a review of some French researches, which were recently carried out in Québec, north-eastern Brazil and southern Africa. We explain why possible discrepancies occur between the results of physical analyses and morphostratigraphic methods. Finally the paper highlights how significant is to relate the thermal history of each sample to the local geological and geomorphic history. Dans les régions de socle, pauvres en repères stratigraphiques, diverses méthodes ont été développées ou adaptées pour connaître l’âge des reliefs, par exemple la datation des manteaux d’altération ou la reconstitution de l’histoire thermique des roches dans la croûte supérieure jusqu’à leur mise à l’affleurement. Ces méthodes radiochronométriques et thermochronologiques ont été largement utilisées durant les deux dernières décennies, indiquant des valeurs et des taux d’érosion dans des orogènes actifs comme dans les régions de socle et de plate-forme. Malgré l’intégration de ces méthodes et de ces résultats à la géomorphologie moderne, ces travaux comportent parfois des contradictions significatives avec les résultats de méthodes géomorphologiques de terrain utilisées antérieurement ou toujours en cours dans de nombreuses régions. Après une présentation des principes de la morphostratigraphie, l’article expose une sélection de travaux récemment publiés sur le bouclier laurentien (Québec), le « Nordeste » brésilien et l’Afrique australe, et examine la nature et les raisons des discordances observées entre les résultats des méthodes physiques et ceux de l’approche morphostratigraphique. Dans tous les cas, la prise en compte des détails de l’histoire thermique de chaque échantillon en relation avec les conditions de l’évolution géologique et géomorphologique locale est indispensable. We thank F. Bonnaud (University of Paris IV) and G. Couix (University of Western Brittany) who helped us to revise figures 1 and 2 and figures 5 and 6 respectively. We also thank Y. Battiau-Queney and two anonymous referees for their useful comments and suggestions. 1In intraplate regions, cratons and surrounding mobile belts coincide with areas of long-term crustal uplift and erosion, which led to the exposure of initially deep-seated structures (Godard et al., 2001). Outside a few sedimentary basins and volcanic areas, which are generally much younger than the ultimate orogenic stages and relate to other geodynamic contexts, they often lack formations, which could be used to date landform generations and evaluate amounts and rates of vertical movements and erosion. Platform areas are more favourable to such evaluations thanks to extensive sediment covers. 2Various methods were developed to reconstruct the landform chronology and rates of evolution through dating of weathering mantles and geomorphic surfaces or reconstruction of the thermal history of upper crust rocks, which presently crop out. Apatite fission track (AFT) dating is based on this last principle: it has been widely used in the last decades and has given estimates of denudation depths and rates in mountain as well as in platform areas (e.g. Gleadow and Brown, 2000). Combined with radiometric methods (e.g. concentration of cosmogenic radio-nucleides such as 10Be ou 26Al in surface or subsurface samples) and/or the measurement of (U-Th)/He in apatites (AHE), these methods give indications on the thermal history of rock samples in the uppermost crust (<4 km) (Green et al., 2006; Gunnell, 2000; Gunnell et al., 2007). Although well integrated in modern geomorphology (Gunnell, 2000; Japsen et al., 2009), some of these works reveal discrepancies with the results of field-based geomorphology (Godard et al., 2001). While emphasizing the interest of morphostratigraphy through a case study where it is so far the only one to be usable (Laurentides), this paper also tends to explain these inconsistencies through a review of two case studies (northeast Brazil, Namibia). 3By analogy with stratigraphy, morphostratigraphy can be defined as the study of the succession of landforms. It provides a relative chronology by adapting the principles of continuity (a given landform is supposed to show the same age in all its parts) and superposition, or substitution (a given landform is older than the landforms that tend to obliterate it). The underlying concept is that landforms are time-dependent and have an age. In fact such an assertion is not true in all cases, since many landforms are constantly reworked and time-independent, either in the “acyclic” cratonic areas (Klein, 1997) or in mountain ranges evolving in steady state conditions. 4The present work is partly based upon the idea that the “age” of a landform or landsurface implies minimal change by denudation processes since its creation (Summerfield et al., 1999). In platform areas as well as in other structural contexts, the most precise ages are obtained on original structural landforms (Peulvast and Vanney, 2001). Corresponding to specific geological dynamics, they were formed during very short events (earthquake, volcanic eruption, meteorite impact) or sequences of processes (e.g. faulting or folding) that can be dated by relative or absolute methods. The original landforms have the same age as the corresponding structure or the ultimate stage of its formation. In favourable conditions, the age of the simplest of these landforms (e.g. co-seismic scarps) may be deduced from their state of preservation (Peulvast and Vanney, 2001). 5The age of erosion landforms is less well defined. A priori, it corresponds to the period when they ceased to evolve. However, the age of a given landform can differ from one part to another (e.g. between the distal and proximal parts of a pediment). Among other conditions, some structural landforms may be created by differential erosion after dissection of a planation surface or through exhumation of buried landscapes. Their age is well known when they relate to a well dated generation of cyclic landforms or a climatic sequence (e.g. the structural landforms of glacial origin identified in east Greenland: Peulvast and Vanney, 2001). Therefore, inherited or fossil structural landforms (e.g. the palaeo-hog’s backs of southern Gaspésie, Quebec, which are still partly sealed by Visean conglomerates; Peulvast et al., 1996) offer the best contribution to landform dating and geomorphic reconstructions. 6Some morphogenetic events, which create new landforms, may be easily identified thanks to stratigraphic markers with a well known geometry and age. Primitive structural surfaces or aggradation surfaces are also useful, if they are well dated. They may be deformed without being immediately eroded, especially if the deformations correspond to faulting or vertical movements. Analysing these deformations and their geomorphic effects is more difficult if stratigraphic markers are lacking, as this frequently occurs in basement areas: other landmarks must be used (Summerfield, 1987). Initially flat surfaces, especially planation surfaces are considered to be the most convenient landmarks to reconstruct the local or regional tectonic and geomorphic history, provided that they are well identified, related with a former base level and dated (Calvet and Gunnell, 2008; Japsen et al., 2009). When well accomplished, planation processes have roughly the same obliterating effects on older topographies as aggradation processes. However, the age of planation surfaces is more difficult to obtain, except if unconformable deposits seal these surfaces. Although some authors assume that planation surfaces may be simultaneously developed at different altitudes in the same region in relation with separate base levels (African Surface of southern Africa: Partridge and Maud, 1987), stepped systems of undeformed surfaces are generally considered as having a chronological meaning (Lageat and Robb, 1984; Klein, 1997). Elements of various ages and origins often coexist in apparently uniform topographies (Peulvast and Claudino Sales, 2005). Uncertainties remain about their age, initial, terminal, before burying or dissection, or since exhumation (Dumont, 1991). They often are diachronic, particularly if they result from scarp retreat. The residuals and scarps that bound them may correspond to lithological controls, without chronological meaning. Some surfaces cannot be dated since they are constantly reworked in the conditions of acyclic regime or slow degradation (Klein, 1997). 7Unconformable sediment and characteristic weathering formations (saprolites, ferricretes, calcretes) may help dating planation surfaces or ‘differenciated’ landscapes (Godard et al., 2001; Vasconcelos and Conroy, 2003; Watchman and Twidale, 2003). However, such dating is delicate because surficial formations are not always correlative of the planation process, which can be older. Moreover, formations, which could be dated by radiochronological methods such as the extensive laterite covers intropical regions, undergo a continuous geochemical evolution. They cannot be considered as closed systems and stable markers (Gunnell, 2003; Nahon, 1991, 2003). 8According to geochemical calculations, the long durations implied in the transformation of kaolinized weathering horizons into ferricretes lead to consider old ages for the underlying topographies. For example, the “haut-glacis” and “moyen-glacis” of western Africa, respectively considered as Early and mid Quaternary in age in former French publications, are older than 8 Ma and 4 Ma (Tardy and Roquin, 1998). Indeed, dating lateritic crusts by the means of the paleomagnetic method and by oxygen isotopes confirms their ‘old’ ages. In West Africa just as in Brazil, the laterites observed in the plane of the African or Sul-Americana surface, considered as Eocene in age, were effectively dated at ~50 Ma (Hénocque et al., 1998; Tardy and Roquin, 1998; Gunnell, 2003). 9Among other well dated superimposed features such as volcanic structures and landforms, the astroblemes - i.e. landforms shaped by degradation of former impact craters - also afford a potential for measuring long-term denudation in intraplate continental domains, which are usually considered as relatively stable (Summerfield, 2000; Peulvast and Vanney, 2001). 11The method has been applied to three Devonian to Triassic large astroblemes located in Quebec, in the Laurentian platform: Charlevoix, Manicouagan, Clear Water Lake (fig. 1; Degeai, 2005; Degeai and Peulvast, 2006). Despite relatively important margins of error (up to 30% or more), the morphometric method provides useful and so far unique indications on long-term denudation rates. Fig. 1 – Main morphostructural features of Québec and location of astroblemes. Fig. 1 – Principales caractéristiques morphostructurales du Québec et localisation des astroblèmes. A: DEM from USGS GTOPO30 elevation database. B: main geologic domains. M = Manicouagan, C = Charlevoix, L = Clear Water Lake (modified from Degeai and Peulvast, 2006). A : MNT à partir des données topographiques GTOPO30 de l’U.S. Geological Survey. B : grandes provinces géologiques. M : Manicouagan, C : Charlevoix, L : Lac à l’Eau Claire (modifiée d’après Degeai et Peulvast, 2006). 12The astroblemes of Quebec are located in the Laurentian plateau and the Labrador peninsula, a part of the Canadian shield, which suffered successive Precambrian orogenic phases: the latest - the Late Proterozoic Grenvillian orogeny - was followed by a major planation phase and subsequent burial during Ordovician transgressions. A carbonate sediment cover was deposited during high sea-level stands. The sediment cover, which was generally no more than 200 m thick in the Laurentides and Labrador peninsula (Rondot, 1989) is almost completely eroded. However, the preservation of Ordovician limestones in annular depressions of the astroblemes of Manicouagan and Charlevoix, and in the impact breccias of the Clear Water Lake, proves that the sediment cover was effectively present during the impact events. We can infer that the initial craters of the three astroblemes probably formed on a low-relief surface. 13From previously established depth/diameter relationships, the true depths of the craters are estimated between 670 ± 210 m for the Clear Water Lake and 1 760 ± 450 m for the Manicouagan. The paleoelevation Ai of the pre-impact topography is obtained by adding the true crater depth dt and the elevation Am at the base of polymictic impact breccias located in the inner basin (fig. 2). The Manicouagan and Charlevoix astroblemes are located in the Laurentian Plateau, where mean elevations range from 400 to 600 m a.s.l. The Clear Water Lake astrobleme is located in a low granite and gneiss plateau with mean elevations of 300-400 m a.s.l. Taking into account the calculated pre-impact elevations (Manicouagan: 2210 ± 500 m; Clear Water Lake: 520 ± 260 m; Charlevoix, western part: 1800 ± 390 m), the post-impact erosion was strongest around the astroblemes of Charlevoix and Manicouagan: 1300 ± 490 m and 1710 ± 600 m, respectively. By contrast, the periphery of the eastern part of the Clear Water Lake was less eroded (<480 m). Fig. 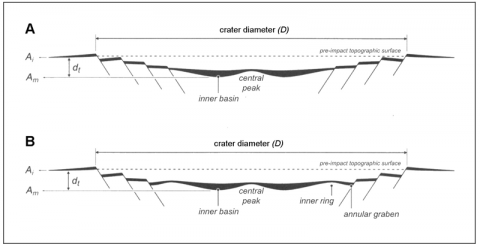 2 – Parameters used to reconstruct the morphology of complex impact craters. Fig. 2 – Paramètres utilisés pour la reconstitution morphométrique des cratères d’impact complexes. A: crater with central peak only; B: crater with ring and central peak. dt: true depth of the crater; Ai: elevation of the pre-impact topography; Am: elevation at the base of polymictic impact breccias (modified from Degeai and Peulvast, 2006). A : cratère avec un pic central seul ; B : cratère avec un anneau et un pic central. dt: profondeur réelle du cratère ; Ai: altitude de la surface précédant l’impact; Am: altitude du fond structural du cratère (base des brèches d’impact polymictiques) (modifiée d’après Degeai et Peulvast, 2006). 14A mean rate of post-impact erosion was calculated. On the Laurentian Plateau, it is estimated at 3.7 ± 1.5 m. Ma–1 for Charlevoix and 8.0 ± 2.8 m. Ma–1 for Manicouagan, respectively since the end of Devonian and Triassic times. In the Labrador Peninsula, post-Pennsylvanian erosion around the Clear Water Lake has taken place at a mean rate lower than 2 m. Ma–1. This suggests a distinct geomorphic evolution between both areas. On the edge of the Canadian shield, post-impact erosion around the astroblemes of Manicouagan and Charlevoix might have occurred during uplift phases of Cretaceous age. In the interior of the shield, the low denudation rates recorded around the Clear Water Lake since the end of the Pennsylvanian reflect a moderate post-Paleozoic uplift, responsible for the exhumation of the sub-Ordovician palaeosurface. After these periods of intense denudation, a swell-like uplift of the Labrador surface occurred to the south-east, probably triggering a stronger dissection in the Laurentides. In the Charlevoix area, within and outside the astrobleme, the results of apatite fission-track dating of basement rocks along the St. Lawrence rift faults were only used to indicate their probable reactivation in the Late Jurassic-Early Cretaceous, which was concurrent with the opening of the Atlantic Ocean (Lemieux et al., 2003). 15The relatively low values of post-impact erosion rates are in agreement with the location of astroblemes in a stable, intra-plate domain, where long-term erosion rates are generally low. Mean rates of vertical erosion in cratonic areas are globally estimated at ~10 m.Ma–1 during the last 100 to 200 million years (Summerfield, 2000; Peulvast and Vanney, 2001; Peulvast and Claudino Sales, 2005). Similar erosion rates were mentioned on the Siberian platform in the vicinity of major astroblemes of 10 km in diameter (Masaitis et al., 1985). 16The study area is part of the semiarid Brazilian Northeast, in the Ceará State. The dominant topographic feature is a continuous, semi-circular escarpment linking the Ibiapaba, Araripe and Borborema plateaus (fig. 3). The crest zone of this highland belt exhibits relatively constant elevations between 1000 and 1200 m a.s.l., at the continental main watershed between the São Francisco drainage basin to the south, and other rivers flowing towards the equatorial Atlantic Ocean. Secondary divides exist within the deep topographic embayment defined by the escarpment. They correspond to a collection of isolated massifs that share similar altitudes (800-1000 m), with steep northern termination outlining two discontinuous E-W-trending alignments of elevated topography that parallel the continental margin. Fig. 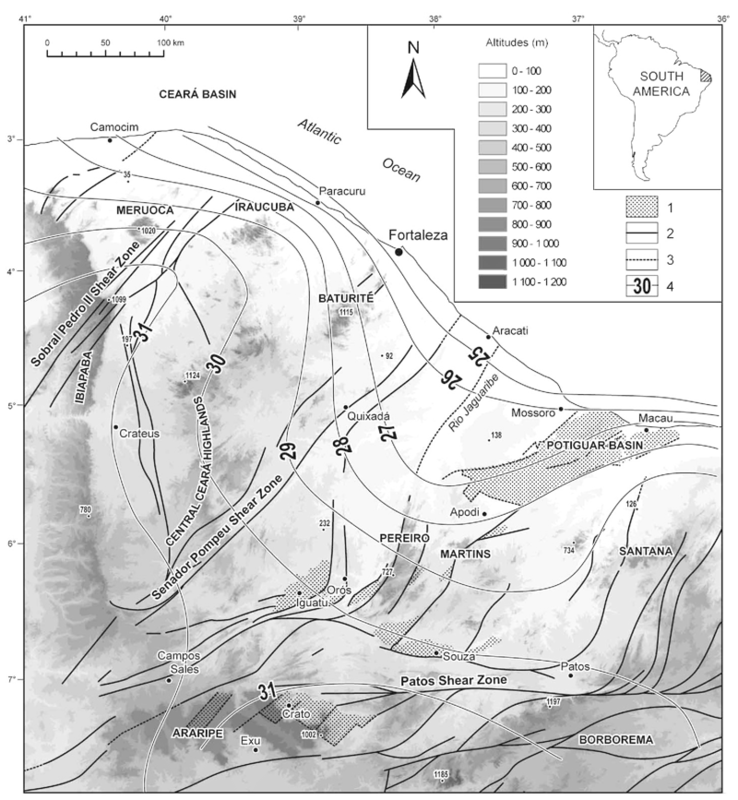 3 – Topography, geological structure and crustal thickness in Northeast Brazil. Fig. 3 – Orographie, structure géologique et épaisseur crustale dans le Nordeste brésilien. 1: Neocomian graben; 2: fault; 3: buried fault; 4: Moho depth in kilometres (after Castro et al., 1997; modified from Peulvast et al., 2008). 1 : graben néocomien ; 2 : faille ; 3 : faille fossilisée ; 4 : profondeur du Moho exprimée en kilomètres (d’après Castro et al., 1997 ; modifiée d’après Peulvast et al., 2008). 17The Ceará segment of the Brazilian Equatorial coastline is a passive continental margin formed by the transform opening of the Equatorial Atlantic in Aptian times (Matos, 2000). Onshore, a wide and discontinuous set of NE-SW basins and half-grabens is known as the Cariri–Potiguar intracratonic rift zone. It consists of aborted Mesozoic rift structures, which are locally buried by remains of a post-rift sediment cover that defines the Araripe and Potiguar basins. This 500-km-long rift zone is intersected by the Atlantic margin in the Potiguar Basin area. The topographic embayment is geologically divided by the Senador Pompeu Shear Zone (SPSZ) into two crustal blocks, with contrasting stratigraphic records. However, this contrast faded over time as shown by a wide development of the embayed erosional plain on both sides of the SPSZ (fig. 3) and by the deposition of Neogene clastic sediments (Barreiras Group) all along the coast. 18Here, the morphostratigraphic method uses elevation differences between marine layers and unconformities of known age at different locations, the pattern of basement–sediment boundaries, and cross-cutting relationship between strata dips and topographic slopes. Post-depositional erosion depths and patterns of crustal deformation are quantified and correlated with reference to current and ancient sea levels. Rock lithofacies are also useful to reconstruct ancient shorelines and palaeodepths of rock burial, and thus to estimate depths of removed overburden. The sedimentary record of on- and offshore basins since the Early Cretaceous times is also a proxy for understanding the state of the palaeolandscape (Peulvast et al., 2008). Two main topographic levels were identified throughout the region (fig. 4): a low plain between 0 and 300 m a.s.l., gently sloping seaward, and the discontinuous remains of a high plain between 750 and 1100 m a.s.l. The latter lacks well defined slope. Both high and low plains correspond to complex mosaics of structural and erosion surfaces of different ages, some of which coincide with exhumed stratigraphic unconformities (Peulvast and Claudino Sales, 2004). Fig. 4 – Synthetic transverse profiles of the Equatorial margin of Northeast Brazil showing the tiered landform systems on both sides of the Senador Pompeu Shear Zone. Fig. 4 – Profils transversaux synthétiques sur la marge équatoriale du Nordeste brésilien, montrant la complexité de l’étagement des formes de part et d’autre de la zone de faille de Senador Pompeu. 1: syn-rift erosion; 2: late and post-Cretaceous erosion. PRS: pre-rift surface, with or without sedimentary cover; AS: Albian (post-rift) surface; CS: Cenomanian structural surface; TS: Tertiary, pre-Barreiras surface; BS: Barreiras accumulation surface; SS: Sertaneja composite surface; IS: intermediate surface (modified from Peulvast et al., 2008). 1 : érosion syn-rift ; 2 : érosion post-rift. PRS : surface pré-rift, avec ou sans couverture sédimentaire ; AS : surface albienne (post-rift) ; CS : surface structurale cénomanienne ; TS : surface tertiaire (pré-Barreiras) ; BS : surface d’accumulation Barreiras ; SS : surface Sertaneja ; IS : surface intermédiaire (modifiée d’après Peulvast et al., 2008). 19Rates and amplitudes of tectonic movements were estimated on the southeast side of the SPSZ and in south Ceará from the altitudes of marine sediments, most of which were deposited in shallow environments. In the Potiguar basin, the base of the Jandaira limestone (92 Ma) currently occurs between -500 m at the coastline near Tibau, and 60-120 m a.s.l. on the edge of the Chapada do Apodi. According to eustatic curves, sea-level was about + 100 m (Miller et al., 2005), so deformation of this limestone layer records a post-Turonian subsidence of ~600 m at the coastline and between 120 m and 0 m at the landward periphery of the basin. Based on the current elevation of marine Albian layers occurring at 700-800 m above present sea level (Baudin and Berthou, 1996), the Araripe basin in the remote hinterland was more vigorously uplifted. Assuming that sea-level rose to +100 m in Albian times (Miller et al., 2005), this suggests minimal post-Albian crustal uplift of 600-700 m, which is comparable to values proposed by Magnavita et al. (1994) in the Recôncavo–Tucano–Jatobá area. Because erosion has not significantly affected the Exu sandstone caprock (Baudin and Berthou, 1996), the ~600-700 m of post-Albian crustal uplift in the area now forming the continental divide ca. 300 km from the coast is also an estimate of long-term surface uplift of this region. The post-Cenomanian crustal deformation mimics the geometry of a broad monocline with a half wavelength of ~300 km, roughly similar on both sides of the Senador Pompeu Shear Zone (fig. 4). Maximum post-rift denudation depths are provided by the maximum value of topographic inversion observed along the eastern Chapada do Araripe, i.e. ~600 m near Crato. The average erosion rate (7 to 10 m·My–1) is similar to that of vertical movements. 20Since the Cenomanian times, the Ceará area of NE Brazil has shown evidence of shallow basin inversion (Peulvast et al., 2008). Uplift resulted in the topographic inversion of the post-rift basins, exhumation of buried surfaces, dissection of the residual Cariri–Potiguar footwall uplands, and expansion of the erosional Sertaneja and coastal plains. Resulting long-term denudation rates in this setting were <10 m·My–1. They are similar to values reported from cratons in Africa (van der Wateren and Dunai, 2001; Gunnell, 2003) and Australia (Vasconcelos and Conroy, 2003). Denudation rates were higher during the Cretaceous rifting and transitional stages, as they are recorded in stratigraphy by the rapid pre-Cenomanian erosion of large parts of the Potiguar footwall uplands, over a period of 20-30 Ma or less (Peulvast and Claudino Sales, 2004). 21The landscape of southern Africa is dominated by the 3500 km-long “Great Escarpment” running almost continuously in a horseshoe-shape curve from Mozambique to Angola. Roughly parallel to the coast and located between 130 and 230 km inland, this scarp separates the continental margins of the Indian and Atlantic oceans from the interior plateau – the Highveld – covering most of the subcontinent. The Lesotho Highlands, where Drakensberg basalts rest on Clarens sandstones, stand as a giant butte overlooking not only the coastal foreland but also this elevated hinterland. Ca.1400 m-thick Karoo sediments have been eroded since Turonian-Conacian times around the center of the Orange catchment, exposing kimberlite pipes at the deepest levels (Lageat, 1989). Conversely, on the Bushmanland Plateau in the northwestern Cape Province, lacustrine crater infills are perfectly preserved in diatremes which yielded Maastrichtian radiometric ages (de Wit, 1999). These data suggest that, inland of the Great Escarpment, the “African surface” has probably been shaped between the two phases of kimberlite intrusions, which peaked at 93-83 and 69-64 Ma. As a result, the interior plateau has undergone minimal lowering (less than 100 m) since the beginning of Tertiary, the Augrabies Falls having acted as a regional base level for areas that lie upstream of the Orange River. 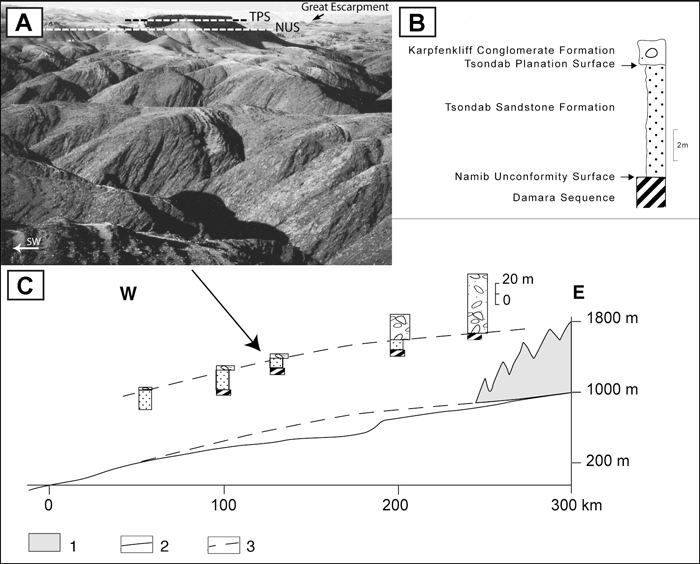 22By contrast with the stepped erosion surfaces of the eastern area, especially in Transvaal (Lageat and Robb, 1984), the major geomorphic regions of Namibia display a more simple distribution pattern (fig. 5). Although continental Tertiary strata are only sporadically preserved outside the Kalahari Basin, terrestrial post-Karoo sedimentation occurred on the marginal plain where a thin and discontinuous cover of Tertiary sediments is found. In the central Namib desert, a major 1000-m high escarpment, with a maximum elevation of 2347 m at Gambsberg, is located 170 km inland of the coastline. This escarpment separates the interior plateau, which has a mean elevation of 1800 m a.s.l., from the coastal plain, which is gently inclined with a gradient of 1% to the southern Atlantic Ocean (fig. 6). This very flat Namib surface is punctuated by a few inselbergs of porphyritic biotite granite, which reach up to 100 m above their surroundings. Actually Ollier (1977) defined two distinct planation surfaces (fig. 6): (1) the “Namib Unconformity Surface” (NUS) truncates the steeply-dipping Late Precambrian schists; (2) the Tsondab Planation Surface or TPS. After the deposition of the aeolian Tsondab Sandstone Formation, which was laid down upon the NUS, the second surface cut across indurated fossil dunes and in places the Precambrian basement, in the form of a vast pediment stretching from the Escarpment to the sea. Fig. 5 – Major geomorphological regions of Namibia. Fig. 5 – Les grandes divisions morphologiques de la Namibie. 1: Great Escarpment; 2: Etendeka lava fields; 3: Namib erg; 4: subvolcanic complexes; 5: west-east profile across the central Namibian piedmont (see fig. 6C). 1 : Grand Escarpement ; 2 : champs de lave d’Etendeka ; 3 : erg du Namib ; 4 : complexes subvolcaniques ; 5 : profil ouest-est au travers du piémont namibien central (voir fig. 6C). Fig. 6 – Cross-cutting relations between topography and stratigraphy on the Namibian piedmont. Fig. 6 – Relations entre topographie et stratigraphie sur le piémont namibien. A: the piedmont double topography. NUS: Namib Unconformity Surface resting on bevelled Damaran schists; TPS: Tsondab Planation Surface overlain by the Karpfenkliff Conglomerate Formation (photo Y. Lageat). B: regional stratigraphic sequence of the Namibian piedmont. C: west-east profile across the central Namibian piedmont. 1: Khomas highlands; 2: deformation of the Karpfenkliff Congomerate Formation (resting either on the metamorphic basement or on the Tsondab Sandstone Formation); 3: longitudinal profile of the Kuiseb river (constructed from 1:100 000 map sheets). A : les deux topographies de piémont. NUS : « Namib Unconformity Surface » tranchant les schistes de Damara ; TPS : Tsondab Planation Surface surmontée par la Formation conglomératique de Karpfenkliff (cliché Y. Lageat). B : séquence stratigraphique régionale du piémont namibien. C : profil ouest-est au travers du piémont namibien central. 1 : hautes terres de Khomas ; 2 : déformation enregistrée par la Formation conglomératique de Karpfenkliff (reposant soit sur le socle métamorphique, soit sur la Formation gréseuse de Tsondab) ; 3 : profil longitudinal du Kuiseb (dessiné à partir des cartes topographiques à 1/100 000). 23The age of the Tsondab Sandstone has long been a contentious issue. According to Ollier (1977), it “could be anything from Precambrian to Tertiary”. Dating of the lithified erg remained problematic till 1995 when the Namibia Palaeontology Expedition established a biostratigraphic scale based on associated mammal faunas and ratite eggshells (Sénut et al., 1995). The fossil content of these aeolianites indicates that sand accumulation began late in the Lower Miocene (15-10 Ma). 24The lithified palaeo-erg is unconformably overlain by the Karpfenkliff Conglomerate Formation (Ward, 1987). This coarse waste cover was deposited in the form of alluvial fans that thinned downslope from 50 m to 0,5 m away from the Great Escarpment. The mean size of the pebbles decreases in the same way from 70 cm to 15 cm. Thick fans of the Mio-Pliocene Karpfenkliff Conglomerate Formation originate in deep embayments of the Great Escarpement, suggesting that important yet localized scarp retreat occurred in relation to their deposition. Substantial erosion of the escarpment region is inferred from the distribution of these Cenozoic sediments: the eastern limit of the Tsondab Sandstone does not follow the foot of the present escarpment, suggesting that the later was less dissected in Miocene times. Most of this differentiated retreat occurred between 10 Ma and 3 Ma, as the age of the Karpfenkliff Formation approaches 3 Ma (van der Wateren and Dunai, 2001). Thus, according to the results of the morphostratigraphic approach, the Great Escarpment would have receded only over a few kilometres during most of Cenozoic times, with an average rate of 10 m.Ma-1, but it would have experienced an accelerated phase of localized backward erosion of up to 2000 m.Ma-1 in the Late Neogene. 25Previous chemical weathering of the bedrock is not expected in this region where no regolith has been recorded under the Tsondab Sandstone outcrops despite extensive mining exploration, and where minerals such as feldspars and heavy minerals lay intact within dune materials. Therefore scarp retreat into sound homogeneous rock must be considered, suggesting active backwearing without etchplanation and downwearing (as demonstrated by Petit et al., 2007, on the Dhofar passive margin). The facies and fabric of the Karpfenkliff conglomerates indicate deposition by high energy flows, which possibly contributed to widen the mouths of mountain valleys by lateral corrasion, whereas slope erosion was enhanced by the production of clasts by thermal weathering (Lageat, 2000). 26The results obtained from astroblemes of the Laurentian Shield cannot be compared to those of previous works, because no other method has yet provided data on the rates of long-term erosion in the study area. Thermochronometric ages were mainly used to date reactivations of the Saint Lawrence fault system (Lemieux et al., 2003). Moreover, in regions such as the Clear Water Lake area, post-impact erosion was so low - less than 500 metres in thickness since the end of the Pennsylvanian - that this value is below the analytical limits of the fission track method. Therefore, morphostratigraphy remains the only valuable tool in such stable areas. 27There is evidence from AFT analysis that the major proportion of the postbreakup denudation estimated for the Namibian margin had occurred by the end of the Cretaceous (Brown et al., 1990). Four subvolcanic igneous complexes (Erongo, Gross Spitzkopje, Klein Spitzkopje, Brandberg), which have ages grouped around 130 Ma, provide indirect constraints on their post-intrusive history as they have been rapidly exhumed from a pile of sediments and basalts between 85 and 65 Ma, at a rate of 250 m. Ma-1 (Raab et al., 2005). Emplaced in the Karoo cover, they form large inselgebirge that rise to some 1500 m above the marginal plain. Through 3D mass balance calculations, a recent work by Rouby et al. (2008) has confirmed that the denudation record since oceanic opening, as inferred from the AFT analysis, is broadly similar to estimates derived from the offshore sedimentary record. Combining AFT thermochronology and cosmogenic isotope analysis, Cockburn et al. (2000) have estimated the erosion rates to be respectively ~40 m.Ma-1 for the vertical erosion and/or 5-10 km.Ma-1 for the Great Escarpment retreat between the continental breakup (130-116 Ma) and the end of Eocene times (36 Ma). However, the offshore sedimentary record suggests that a major part of the erosion occurred some 40 My later than the initiation of seafloor spreading, probably as a consequence of rifting-independent causes, as shown on other passive margins (Séranne and Anka, 2005; Japsen et al., 2009). The major volume of sediments within the Walvis and Orange basins was deposited during the Late Cretaceous as a thick detrital wedge covering the horst and graben structures of the margin. The volume determined by Rust and Summerfield (1990) equates to a denudation depth of 1.8 km averaged over the Atlantic-draining catchments (including the Orange River basin) south of the latitude of the Walvis Ridge. 28However, some discrepancies between morphostratigraphic and ‘absolute’ dating methods in Namibia deserve fuller explanations. The values obtained for Late Tertiary erosion rates - only 2-15 m.Ma–1 oceanward of the present escarpment position since the end of Eocene - are in sharp contrast with morphostratigraphic results (Lageat, 2000) and with estimates derived from the offshore sedimentary record (corrected for compaction) in the Walvis and Outeniqua basins (Dingle, 1982). Evidence for an increased accumulation of clastic sediments during the Neogene (31 m.Ma–1) was found in these basins, after a long hiatus from the Late Eocene to the Lower Miocene. A rapid retreat of the marginal scarp with regard to its initial position may be verified by a forgotten evidence: northwest of Aus, some 50 km westward of the Great Escarpment, Dicker Willem (Garubberg), a circular inselberg 2.5 km in diameter, rising 600 m above the southern Namib coastal plain, is a subvolcanic carbonatite complex intruded in the Namaqualand Metamorphic Complex around 49 Ma (Reid et al., 1990). This inselberg means that, in strong contrast with the interior plateau, denudation has been active until the completion of the Namib Unconformity Surface before its fossilisation by aeolianites of the Tsondab Sandstone, mainly through marginal backwearing. A possible explanation for the discrepancy between these facts and the results of combined fission-track thermochronology and cosmogenic isotope analysis is that samples studied by Cockburn et al. (2000) have been collected on top of three bornhardts and on the slope of a spur at the foot of the Gambsberg, which did not experience a substantial evolution, being located outside the locus of active erosion and scarp retreat. 29Why did a renewed episode of erosion occur during a long period of prevailing aridity? According to recent geological studies the emplacement of the African superswell was responsible for a phase of Miocene uplift (Séranne and Anka, 2005), confirmed by the morphostratigraphical evidence. The Karpfenkliff Formation represents the last widespread deposition event on the piedmont before deep dissection of the coastal plain by the escarpment-crossing rivers. This incision and the consequent preservation of palaeosurfaces are thought to have occurred at the end of the Tertiary (Van der Wateren and Dunai, 2001). Rather than indicating a change towards progressive aridification, the convex-up inflections in the profile of the coastal rivers may indicate the locus of the flexure axis which could have been reactivated. Thus the western section of the Great Escarpment is supposed to have experienced two epeirogenic uplift stages, namely in the Miocene and close to the end of the Pliocene, as postulated by Partridge and Maud (1987) along its eastern counterpart. However, the magnitude of the epeirogenic movements seems to have been intuitively overestimated (between 200 and 300 and between 600 m and 900 m, respectively). 30In the Ceará region of NE Brazil, depths of post-Cenomanian denudation obtained by morphostratigraphic methods (Peulvast et al., 2008) differ from AFT-derived estimates reported by Morais Neto et al. (2005-2006) from Paleozoic and Jurassic sandstones of the Araripe basin, to the south. AFTA results indicated paleotemperatures of 70-85 °C during the Cenozoic, implying burial by a considerable thickness of younger section, followed by 1.5 km of post-rift denudation. This is twice to three times as much as the ~0.6 km denudation estimated in the study by Peulvast et al. (2008) and deduced from the lack of any remnant of younger deposits that could have overlain the fluvial Exu sandstones. Such a post-Cenomanian deposition, suggested by P. Green (pers. comm., 2008), would not support the interpretation already given by Harman et al. (1998) and confirmed by Morais Neto et al. (2005-2006), of a thermal history indicating a cooling episode beginning between 100 Ma and 90 Ma (Late Albian-Turonian), i.e synchronous with the end of the fluvial sedimentation. This episode might reflect an exhumation process hardly compatible with ongoing sedimentation. Moreover, it is not known how and when the supposed additional overburden has been added. Whereas the basal Exu sandstone layers still record a weak syn-sedimentary deformation in the centre of the basin, the upper layers are horizontal on a NS profile and seem to reflect the end of the post-rift subsidence in the basin. Such an overburden of about 1000 m would not have been deposited without further deformation of the underlying layers, unless it was spread on the whole area, outside the present limits of the basin. 31The most critical point is the geomorphic likelihood of the scenario suggested on the basis of the AFTA. The nature and origin of the hypothetic layer of ~1000 m of additional sediments remains speculative, since the regional landscape has been interpreted as to have remained surrounded by low hills in the Late Cretaceous. The most probable source area would be the Borborema plateau, which is located to the east and has provided the Exu sandstone (Assine, 1992). However, there is no available model that would explain the deposition of such a volume of sediments in the backslope area of these highlands, which were uplifted along the eastern margin of Brazil, without known topographic limits to the west (Parnaiba basin), to the south (Jatoba basin) or to the north. 32The present chapada is only a remnant of the former sedimentary infill of the Araripe basin, and of a much wider sedimentation area, at least to the south. Its near-structural surface might be the result of differential erosion if less resistant layers overlying the harder rocks have been removed. However, the exhumation of surrounding basement surfaces, former pre-Cenomanian, pre-Aptian or even pre-Paleozoic surfaces (Peulvast and Claudino Sales, 2004), probably began early, as early as the Paleogene: widespread laterite covers, which are present to the northwest of the chapada, could not form later, due to the climatic conditions of the Neogene (Tardy and Roquin, 1998; Bétard, 2007). This is a clue to assert an early beginning of the process of basin topographic inversion, which might correspond to the first cooling and post-rift denudation episode reported by the AFTA, soon after the end of the fluvial sedimentation. The second cooling episode, during the Oligocene and later, would correspond to the major stage of river incision and basin inversion, resulting from differential erosion related to regional uplift. 33According to Morais Neto et al. (2005-2006), maximal paleotemperatures recorded by all samples, including the Exu sandstones, suggest that no significant burial occurred in the region in the late Cretaceous and later. Hence, ages obtained from the Cretaceous sediments may represent legacies from the source areas. The Exu sandstones unconformably lie upon the older formations, including the basement. Local burial, uplift and denudation events may have locally occur before the deposition of these fluvial sediments on the margins of the basin. Since the morphology (including both exhumed and still buried paleolandforms) and structure of this basin are quite complex, with differential movements lasting until the end of the post-rift period (Baudin and Berthou, 1996), caution should apply to the interpretation of the thermal history of each sample. 34In the diagram of thermal histories published by Morais Neto et al. (2005-2006), all samples show palaeotemperatures of 40-60°C before the Cenozoic cooling event. This is interpreted as reflecting a denudation of 1.5 km of sediments. As already discussed in Peulvast et al. (2008) and in Gunnell (2003), a high degree of uncertainty must be taken into account in such low depth ranges. Moreover, we cannot rule out a change in the geothermal gradient during the Oligocene, which is the time of regional volcanism. This is the reason why we tend to favour the conclusions given by Baudin and Berthou (1996): “The sand and conglomerates (Arajara and Exu Formations) that are deposited fill the depression and mark the end of the sedimentary history of the Araripe basin” (translated from the French text). The discrepancy between the two sets of results could result from an overprediction of late-stage rock cooling by thermal modelling algorithms that do not take into account low-temperature annealing. Artefacts of this kind would typically imply >1 km of recent denudation (Gunnell, 2003) that may not have effectively occurred. However, effects on palaeogeothermal gradients of a regional magmatic event that occurred during the Cenozoic might also explain such a discrepancy. 35Studies based upon geomorphological methods, mainly morphostratigraphy, still appear as essential tools to date landforms, evaluate erosion rates and constrain the interpretation of results provided by methods of “absolute” dating. Despite its relative imprecision when applied to astroblems, morphostratigraphy is still irreplaceable in stable areas such as the Canadian shield on the backslope of the Laurentide uplifted zone, where vertical movements and denudation values are too low to be quantified by the currently available physical methods. In the other case studies described here, the results are challenged by some of the published data obtained by radio- and thermochronometry. Discrepancies are observed in values of denudation over given periods, despite constraints provided by the presence of sedimentary remnants, inverted basins or waste covers that indicate minimal values of erosion. In northeast Brazil, the debate bears on the maximal depth of erosion, since AFT results seem to indicate higher denudation values, in contradiction with the lack of stratigraphic evidence for the former existence of the missing slice of rock. In Namibia, on the contrary, higher denudation rates were found on the basis of morphostratigraphic evidence. In both cases, both approaches are questioned, stressing the necessity to cross-check and calibrate their respective results, and to seek in method uncertainties or in other fields, the reasons of observed discrepancies. Studies based upon the thermal history of each sample in relation with the local geological and geomorphic history, when they are well constrained, should explain some of these inconsistencies and bear important implications on rates and fundamental processes of long-term landform evolution in shield and platform areas. Assine M. (1992) – Paleocorrentes e paleogeografia na Bacia do Araripe, Nordeste do Brasil. Revista Brasileira de Geociências 24(4), 223-232. Baudin F., Berthou P.Y. (1996) – Environnements de dépôt de la matière organique des sédiments aptiens-albiens du bassin d’Araripe (NE du Brésil). Bulletin du Centre de Recherches Exploration-Production Elf-Aquitaine 20, 213-227. Bétard F. (2007) – Montagnes humides au cœur du Nordeste brésilien semi-aride : le cas du massif de Baturité (Ceará). Apports d’une approche morpho-pédologique pour la connaissance et la gestion des milieux. Thèse de doctorat (unpublished), université de Paris IV-Sorbonne, Paris, 442 p.
Brown R.W., Rust D.J., Summerfield M.A., Gleadow A.J.W., de Wit M.C.J. (1990) – An early Cretaceous phase of accelerated erosion on the south-western margin of Africa: evidence from apatite fission track analysis and the offshore sedimentary record. Nuclear Tracks Radiation and Measurement 17, 3, 339-350. Calvet M., Gunnell, Y. (2008) – Planar landforms as markers of denudation chronology: an inversion of East Pyrenean tectonics based on landscape and sedimentary basin analysis. In Gallagher K., Jones S.J., Wainwright J. (Eds), Landscape evolution: denudation, climate and tectonics over different time and space scales. Geological Society, London, Special Publications 296, 147-166. Castro D.L., Barbosa V.C.F., Silva J.B.C., Medeiros W.E. (1997) – Relevo da interface crosta-manto entre os vínculos de isostasia e suavidade. Congresso Internacional da Sociedade Brasileira de Geofísica 5, São Paulo, Anais, 682–685. Cockburn H.A.P., Brown R.W., Summerfield M.A., Seidl M.A. (2000) – Quantifying passive margin denudation and landscape development using a combined fission track thermochronology and cosmogenic isotope analysis approach. Earth and Planetary Science Letters 179, 429-435. Degeai J.P. (2005) – Mesure de l’érosion à différentes échelles spatio-temporelles autour des maars et des astroblèmes : exemples dans le Massif central français et le Québec. Thèse de Doctorat (unpublished), université Paris-Sorbonne, 451 p.
Degeai J.P., Peulvast J.P. (2006) – Calcul de l’érosion à long terme en région de socle autour de grands astroblèmes du Québec et de France. Géographie Physique et Quaternaire 60, 2, 131-148. De Wit M.C.J. (1999) – Post-Gondwana drainage and the development of diamond placers in western South Africa. Economic Geology 94, 721-740. Dingle R.V. (1982) – Continental margin subsidence: a comparison between the east and west coasts of Africa. In Scrutton R.A. (Ed. ), Dynamics of passive margins. Geodynamics Series, 6, American Geophysical Union, 59-71. Dumont P. (1991) – Problèmes de datation des surfaces d’aplanissement au Zaïre. Bulletin de la Société géographique de Liège 27, 175-185. Gleadow A.J.W., Brown R.W. (2000) – Fission-track thermochronology and the long-trem denudational response to tectonics. In Summerfield M.A. (ed. ), Geomorphology and global tectonics. J. Wiley and Sons, Chichester, 57-76. Godard A., Lagasquie J.J., Lageat Y. (Eds), (2001) – Basement regions. Springer, Berlin, Heidelberg, New York, 306 p.
Green P.F., Crowhurst P.V., Duddy I.R., Japsen P., Holford S.P. (2006) – Conflicting (U-Th)/He and fission track ages in apatite: enhanced He retention, not anomalous annealing behaviour. Earth and Planetary Science Letters 250, 407-427. Gunnell Y. (2000) – Apatite fission track thermochronology: an overview of its potential and limitations in geomorphology. Basin Research 12, 115-132. Gunnell Y. (2003) – Radiometric ages of laterites and constraints on long-term denudation rates in West Africa. Geology 31, 2, 131-134. Gunnell Y., Braucher R., Bourlès D., André G. (2007) – Quantitative and qualitative insights into bedrock landform erosion on the South Indian craton using cosmogenic nuclides and apatite fission tracks. Geological Society of America Bulletin 119(5), 576-585. Harman R., Gallagher K., Brown R., Raza A. (1998) – Accelerated denudation and tectonic/geomorphic reactivation of the cratons of northeastern Brazil during the Late Cretaceous. Journal of Geophysical Research 103, 27091-27105. Hénocque O., Ruffet G., Colin F., Féraud G. (1998) – 40Ar/39Ar dating of West African lateritic cryptomelanes. Geochimica et Cosmochimica Acta 62, 2739-2756. Japsen P., Bonow J., Green P., Chalmers J.A., Lidmar-Bergström K. (2009) – Formation, uplift and dissection of planation surfaces at passive continental margins – a new approach. Earth Surface Processes and Landforms, DOI: 10.1002/esp.1766. Klein C. (1997) – Du polycyclisme à l'acyclisme en géomorphologie. Ophrys, Gap, 299 p.
Lageat Y. (1989) – Le relief du Bushveld, une géomorphologie des roches basiques et ultrabasiques. Publications de la Faculté de Lettres et Sciences Humaines de l’Université Blaise-Pascal, Clermont-Ferrand, 591 p.
Lageat Y. (2000) – La surface de piémont de Namibie. Géomorphologie : relief, processus, environnement 1, 3-12. Lageat Y., Robb L.J. (1984) – The relationships between structural landforms, erosion surfaces and the geology of the Archean granite basement in the Barberton region, Eastern Transvaal. Transactions of the Geological Society of South Africa 87, 141-159. Lemieux Y., Tremblay A., Lavoie D. (2003) – Structural analysis of supracrustal faults in the Charlevoix area, Québec: relation to impact cratering and the St Laurent fault system. Canadian Journal of Earth Science 40(2), 221-235. Magnavita L.P., Davison I., Kuznir N.J. (1994) – Rifting, erosion and uplift history of the Reconcavo-Tucano-Jatoba Rift, northeast Brazil. Tectonics 13, 367-388. Masaitis V.L., Maschchak M.S., Yezerskiy V.A. (1985) – The longevity of impact structures under different geological conditions. International Geology Review 27, 556-562. Matos R.M.D. (2000) – Tectonic evolution of the Equatorial South Atlantic. In Atlantic Rifts and continental margins, Geophysical Monograph 115, American Geophysical Union, 331-354. Melosh H.J. (1989) – Impact cratering: a geologic process. Oxford University Press, New York, 245 p.
Miller K.G., Kominz M.A., Browning J.V., Wright J.D., Mountain G.S., Katz M.E., Sugarman P.J., Cramer B.S., Christie-Blick N., Pekar S.F. (2005) – The Phanerozoic record of global sea-level change. Science 310, 1293-1298. Morais Neto J.M., Hegarty K., Karner J.D. (2005-2006) – Abordagem preliminar sobre paleotemperatura e evolução do relevo da bacia do Araripe, Nordeste do Brasil, a partir da análise de traços de fissão em apatita. Boletim de Geociências PETROBRAS 14(1), 113-119. Nahon D. (1991) – Introduction to the petrology of soils and chemical weathering. John Wiley & Sons, New York, 313 p.
Nahon D. (2003) – Altérations dans la zone tropicale. Signification à travers les mécanismes anciens et/ou encore actuels. C.R. Geoscience 335(16), 1109-1119. Ollier C.D. (1977) – Outline geological and geomorphic history of the central Namib Desert. Madoqua 10(3), 207-212. Partridge T.C., Maud R.R. (1987) – Geomorphic evolution of southern Africa since the Mesozoic. South African Geological Journal 90(2), 179-208. Petit C., Fournier M., Gunnell Y. (2007) – Tectonic and climatic controls on rift escarpments: erosion and flexural rebound of the Dhofar passive margin (Gulf of Aden, Oman). Journal of Geophysical Research 112, B03406, doi: 10.1029/2006JB004554. Peulvast J.P., Bouchard M., Jolicoeur S., Pierre G., Schroeder J. 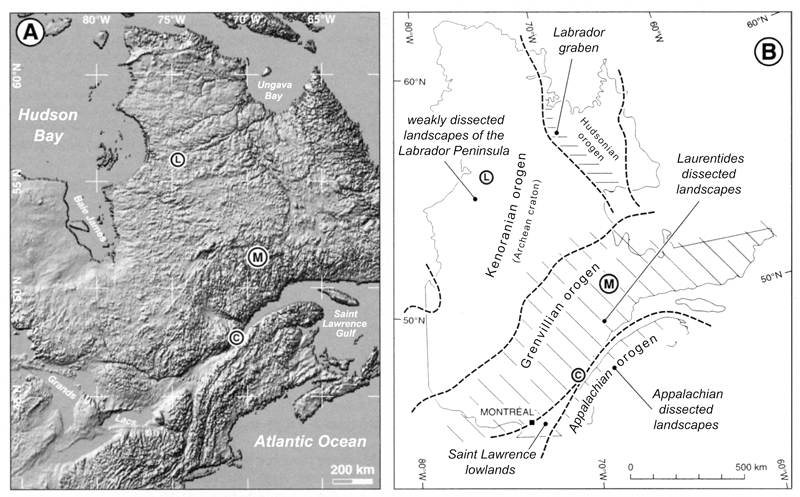 (1996) – Palaeotopographies and post-orogenic morphotectonic evolution around the Baie des Chaleurs (Eastern Canada). Geomorphology 16, 5-32. Peulvast J.P., Claudino Sales V. (2004) – Stepped surfaces and palaeolandforms in the northern Brazilian “Nordeste”: constraints on models of morphotectonic evolution. Geomorphology 62, 89-122. Peulvast J.P., Claudino Sales V. (2005) – Surfaces d’aplanissement et géodynamique. Géomorphologie : relief, processus, environnement 4, 249-274. Peulvast J.P., Claudino Sales V., Bétard F., Gunnell Y. (2008) – Low post-Cenomanian denudation depths across the Brazilian Northeast: implications for long-term landscape evolution at a transform continental margin. Global and Planetary Change 62, 39-60. Peulvast J.P., Vanney J.R. (2001) – Géomorphologie structurale (Terre, corps planétaires solides). Vol. 1 : Relief et structure. Gordon and Breach (Paris) et BRGM (Orléans), 505 p.
Raab M.J., Brown R.W., Gallagher K., Weber K., Gleadow A.J.W. 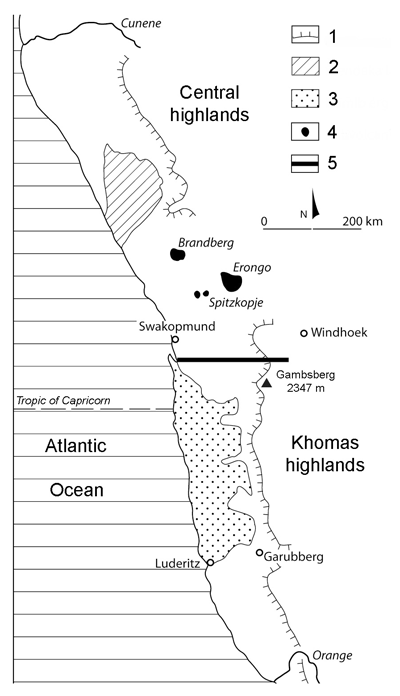 (2005) – Denudational and thermal history of the Early Cretaceous Brandberg and Okenyenya igneous complexes on Namibia’s Atlantic passive margin. Tectonics 24, 1-15. Reid D.L., Rex D.C. and Harmer R.E., 1990 – Timing of post-Karoo alkaline volcanism in southern Namibia. Geological Magazine 127, 427-433. Rondot J. (1989) – Géologie de Charlevoix. Ministère de l’énergie et des ressources, Québec, MB89-21, 606 p.
Rondot J. (1998) – Les brèches d’impact météoritique de Charlevoix. Ministère des Ressources Naturelles, Québec, ET97-04, 31 p.
Rouby D., Bonnet S., Guillocheau F., Gallagher K., Robin C., Biancotto, Dauteuil O., Braun J. (2008) - Sediment supply to the Orange sedimentary system over the last 150 MY: An evaluation from sedimentation/denudation balance. Marine and Petroleum Geology. Rust D.J., Summerfield M.A. (1990) – Isopach and borehole data as indicators of rifted margin evolution in southwestern Africa. Marine and Petroleum Geology 7, 277-287. Sénut B., Pickford M., Mein P. (1995) – Les falaises d'Awasib : une coupe-type pour le Cénozoïque continental de Namibie. Comptes-Rendus de l'Académie des Sciences 321, IIa, 775-780. Séranne M., Anka Z. (2005) – South Atlantic continental margins of Africa: a comparison of the tectonic versus climate interplay on the evolution of equatorial west Africa and SW Africa margins. Journal of African Earth Sciences 43, 283-300. Summerfield M.A. (1987) – Neotectonics and landform genesis. Progress in Physical Geography, 11, 3, 384-397. Summerfield M.A. (2000) – Geomorphology and global tectonics. J. Wiley and Sons, Chichester, 367 p.
Summerfield, M.A., Sugden, D.E., Denton, G.H., Marchant, D.R., Cockburn, H.A.P., Stuart, F.M. (1999) – Cosmogenic isotope data support previous evidence of extremely low rates of denudation in the Dry Valleys region, southern Victoria Land, Antarctica. Geological Society Special Publication 162, p. 255-267. Tardy Y., Roquin C. (1998) – Dérive des continents, paléoclimats et altérations tropicales. BRGM, Orléans, 473 p.
Van der Wateren F.M., Dunai T.J. (2001) – Late Neogene passive margin denudation history – cosmogenic isotope measurements from the central Namib desert. Global and Planetary Change 30, 271-307. Vasconcelos P.M., Conroy M. (2003) – Geochronology of weathering and landscape evolution, Dugald River valley, NW Queensland, Australia. Geochimica et Cosmochimica Acta 67, 2913-2930. Ward J.D. (1987) – The Cenozoic succession in the Kuiseb valley, central Namib Desert. Geological Survey of South-West Africa/Namibia, Memoir 9, Windhoek, 124 p.
Watchman A.L., Twidale C.R. (2003) – Relative and “absolute” dating of land surfaces. Earth Science Reviews 58, 1-49. Dans les régions de socle, pauvres en repères stratigraphiques, diverses méthodes ont été récemment développées ou adaptées aux côtés des méthodes de type morphostratigraphique (détermination des âges relatifs des formes, datation par les relations avec des formations corrélatives), pour donner des indications sur l’âge des reliefs. Il s’agit, par exemple, de la datation des manteaux d’altération ou de la reconstitution de l’histoire thermique des roches dans la croûte supérieure jusqu’à leur mise à l’affleurement. Ces méthodes radiochronométriques et thermochronologiques ont été largement utilisées durant les deux dernières décennies (Gleadow et Brown, 2000 ; Gunnell, 2000), indiquant des valeurs et des taux d’érosion en montagne comme dans les régions de plate-forme et apportant de nouveaux facteurs limitants pour la modélisation des bassins et des marges passives. Malgré une intégration efficace de leurs méthodes et de leurs résultats à la géomorphologie moderne, ces travaux comportent parfois des contradictions significatives avec les résultats de méthodes de terrain traditionnelles utilisées antérieurement ou toujours en usage dans de nombreuses régions (par exemple : Scandinavie, Groenland, Afrique australe, Inde, Brésil). Après un rappel des principes de la morphostratigraphie, l’article présente un choix de travaux récemment publiés par des géomorphologues français dans trois régions différentes de socle plus ou moins directement associées à des marges passives (Laurentides, Nordeste brésilien, Afrique australe), ainsi que la discussion de leurs résultats, comparés à ceux publiés dans la littérature internationale. La présence de trois grandes structures d’impact sur le bouclier laurentien au Québec (fig. 1) a permis d’y appliquer une nouvelle méthode géomorphologique de mesure de l’érosion sur le long terme (Degeai et Peulvast, 2006). La morphométrie initiale du cratère est reconstituée, afin d’estimer l’altitude de la topographie pré-impactique. Deux paramètres sont considérés (fig. 2) : le diamètre de la structure d’impact et sa profondeur réelle, c’est-à-dire la distance entre la topographie pré-impactique et le fond structural du cratère fossilisé sous les impactites. Une relation entre ces deux paramètres a été déterminée à partir d’une base de données comportant 31 cratères d’impact complexes terrestres bien conservés. L’épaisseur de substrat érodé est évaluée en retranchant l’altitude actuelle du relief autour de l’astroblème de celle de la topographie pré-impactique. L’érosion post-impactique autour des astroblèmes de Charlevoix, du Lac à l’Eau Claire et du Manicouagan aurait déblayé des tranches de substrat respectivement de 700 à 1 800 m, 100 à 200 m et 1 100 à 2 200 m. À partir de ces valeurs, les taux moyens d’érosion post-impactique autour de ces trois astroblèmes ont été estimés de 2 à 5 mm.ka-1, de 0,35 à 0,7 mm.ka-1 et de 5 à 10 mm.ka-1, respectivement depuis le Dévonien, le Pennsylvanien et le Trias. Sur la marge équatoriale du Nordeste brésilien, le Ceará et les régions voisines ont subi depuis le Cénomanien une inversion modérée des bassins sédimentaires alignés sur la zone de rift Cariri-Potiguar (Peulvast et al., 2008 ; fig. 3). Le soulèvement a engendré l’inversion topographique des bassins post-rift, l’exhumation de surfaces enfouies servant de plans de discordance, la dissection des reliefs résiduels des épaules de rift et l’expansion de la basse surface d’érosion appelée Surface Sertaneja (fig. 4). Les vitesses d’érosion correspondantes, sur le long terme, ont été inférieures à 10 m·My–1 et comparables aux taux obtenus sur les cratons africains (van der Wateren et Dunai, 2001; Gunnell, 2003) et australiens (Vasconcelos et Conroy, 2003). Les vitesses d’érosion ont été plus élevées pendant le rifting crétacé et les stades de transition, comme le montre l’enregistrement stratigraphique d’une rapide érosion pré-cénomanienne d’une grande partie de l’épaule sud du rift Potiguar, en 20–30 Ma ou moins, c’est-à-dire avant le dépôt du grès Açu (Peulvast et Claudino Sales, 2004). En Namibie centrale (fig. 5), la surface de piémont du Grand Escarpement occidental de l’Afrique australe apporte, grâce à la datation des dépôts qui lui sont associés, l'opportunité d'analyser les conditions qui ont concouru à son élaboration depuis l’ouverture de l’Atlantique sud. Ce plan incliné juxtapose deux topographies distinctes (Ollier, 1977 ; fig. 6) : la "Namib Unconformity Surface" et la "Tsondab Planation Surface", inscrite à la fois dans le socle et dans des grès rougeâtres qui correspondent à des vestiges d'un paléoerg mis en place entre 15 et 10 Ma (Sénut et al., 1995). Le façonnement de la "Tsondab Planation Surface", postérieur à la grésification des sables dunaires, s'est accompagné d'un recul du front montagneux contemporain des épandages détritiques de la "Karpfenkliff Conglomerate Formation" (Ward, 1987 ; fig. 6). Ces cônes s’enracinent dans des "embayments" dont la profondeur indique un retrait moyen du Grand Escarpement de 2 km.Ma-1 entre 10 et 2,8 Ma. Dans la discussion sont abordées la nature et les raisons des discordances observées entre les résultats des méthodes physiques (Nordeste brésilien, Namibie) et ceux de l’approche morphostratigraphique, ainsi que les principales implications quant à l’évaluation des vitesses d’érosion dans les domaines de socle et de plate-forme. Tandis que les vitesses d’érosion obtenues au Québec apparaissent pour l’heure les seules disponibles, celles relatives aux marges du Nordeste brésilien et de Namibie paraissent contredites par certains résultats de la radiochronologie et de la thermochronologie. Dans le cas namibien, la discordance peut relever d’un problème de localisation des échantillons – sur des inselbergs hors d’atteinte des phénomènes associés au recul néogène de l’escarpement – et dans le cas brésilien, d’une surestimation du refroidissement tardif des roches par les algorithmes de modélisation thermique, qui ne prennent pas en compte l’effacement des traces de fission à basse température. De tels artéfacts impliqueraient typiquement plus d’un km d’érosion récente qui peut ne jamais avoir eu lieu (Gunnell, 2003). Les effets d’un événement magmatique régional intervenu durant le Cénozoïque pourraient aussi expliquer le décalage. Dans tous les cas, la prise en compte des détails de l’histoire thermique de chaque échantillon en relation avec les conditions de l’évolution géologique et géomorphologique locale est indispensable. A: DEM from USGS GTOPO30 elevation database. B: main geologic domains. M = Manicouagan, C = Charlevoix, L = Clear Water Lake (modified from Degeai and Peulvast, 2006). A : MNT à partir des données topographiques GTOPO30 de l’U.S. Geological Survey. B : grandes provinces géologiques. M : Manicouagan, C : Charlevoix, L : Lac à l’Eau Claire (modifiée d’après Degeai et Peulvast, 2006). Fig. 2 – Parameters used to reconstruct the morphology of complex impact craters. Fig. 2 – Paramètres utilisés pour la reconstitution morphométrique des cratères d’impact complexes. A: crater with central peak only; B: crater with ring and central peak. dt: true depth of the crater; Ai: elevation of the pre-impact topography; Am: elevation at the base of polymictic impact breccias (modified from Degeai and Peulvast, 2006). A : cratère avec un pic central seul ; B : cratère avec un anneau et un pic central. dt: profondeur réelle du cratère ; Ai: altitude de la surface précédant l’impact; Am: altitude du fond structural du cratère (base des brèches d’impact polymictiques) (modifiée d’après Degeai et Peulvast, 2006). 1: Neocomian graben; 2: fault; 3: buried fault; 4: Moho depth in kilometres (after Castro et al., 1997; modified from Peulvast et al., 2008). 1 : graben néocomien ; 2 : faille ; 3 : faille fossilisée ; 4 : profondeur du Moho exprimée en kilomètres (d’après Castro et al., 1997 ; modifiée d’après Peulvast et al., 2008). Fig. 4 – Synthetic transverse profiles of the Equatorial margin of Northeast Brazil showing the tiered landform systems on both sides of the Senador Pompeu Shear Zone. Fig. 4 – Profils transversaux synthétiques sur la marge équatoriale du Nordeste brésilien, montrant la complexité de l’étagement des formes de part et d’autre de la zone de faille de Senador Pompeu. 1: syn-rift erosion; 2: late and post-Cretaceous erosion. PRS: pre-rift surface, with or without sedimentary cover; AS: Albian (post-rift) surface; CS: Cenomanian structural surface; TS: Tertiary, pre-Barreiras surface; BS: Barreiras accumulation surface; SS: Sertaneja composite surface; IS: intermediate surface (modified from Peulvast et al., 2008). 1 : érosion syn-rift ; 2 : érosion post-rift. PRS : surface pré-rift, avec ou sans couverture sédimentaire ; AS : surface albienne (post-rift) ; CS : surface structurale cénomanienne ; TS : surface tertiaire (pré-Barreiras) ; BS : surface d’accumulation Barreiras ; SS : surface Sertaneja ; IS : surface intermédiaire (modifiée d’après Peulvast et al., 2008). Fig. 5 – Major geomorphological regions of Namibia. Fig. 5 – Les grandes divisions morphologiques de la Namibie. 1: Great Escarpment; 2: Etendeka lava fields; 3: Namib erg; 4: subvolcanic complexes; 5: west-east profile across the central Namibian piedmont (see fig. 6C). 1 : Grand Escarpement ; 2 : champs de lave d’Etendeka ; 3 : erg du Namib ; 4 : complexes subvolcaniques ; 5 : profil ouest-est au travers du piémont namibien central (voir fig. 6C). A: the piedmont double topography. NUS: Namib Unconformity Surface resting on bevelled Damaran schists; TPS: Tsondab Planation Surface overlain by the Karpfenkliff Conglomerate Formation (photo Y. Lageat). B: regional stratigraphic sequence of the Namibian piedmont. C: west-east profile across the central Namibian piedmont. 1: Khomas highlands; 2: deformation of the Karpfenkliff Congomerate Formation (resting either on the metamorphic basement or on the Tsondab Sandstone Formation); 3: longitudinal profile of the Kuiseb river (constructed from 1:100 000 map sheets). A : les deux topographies de piémont. NUS : « Namib Unconformity Surface » tranchant les schistes de Damara ; TPS : Tsondab Planation Surface surmontée par la Formation conglomératique de Karpfenkliff (cliché Y. Lageat). B : séquence stratigraphique régionale du piémont namibien. C : profil ouest-est au travers du piémont namibien central. 1 : hautes terres de Khomas ; 2 : déformation enregistrée par la Formation conglomératique de Karpfenkliff (reposant soit sur le socle métamorphique, soit sur la Formation gréseuse de Tsondab) ; 3 : profil longitudinal du Kuiseb (dessiné à partir des cartes topographiques à 1/100 000). Jean-Pierre Peulvast, François Bétard et Yannick Lageat, « Long-term landscape evolution and denudation rates in shield and platform areas: a morphostratigraphic approach », Géomorphologie : relief, processus, environnement, vol. 15 - n° 2 | 2009, 95-108. Presses Universitaires de Bordeaux, 2013, 200 p.